The world is a dangerous place, filled with all manner of perils, from villains and evil-doers to the local terrain and all the things in between: all seem intent on putting an end to the lives of those who would dare stand against them. So in the face of such perils one would ask what could be worse, what terror could summon such feelings of dread as to incapacitate its prey? The answer is simple; the unknown. When the hunters become the hunted there is little to fall back on and even a trusty sword can only provide so much protection. Now you will have knowledge, knowledge that even the most hardened of warriors would be unwise to scoff at. Bringing together a collection of vile and horrifying creatures with which to populate the dark places of your fantasy world and reside in your character's nightmares. Ultimate Monsters has been developed to aid both players and Games Masters alike as they venture into a wider and more dangerous world. Covering all manner of creatures, from the denizens of the murky depths of the ocean to the soaring masters of the sky and everything in between. 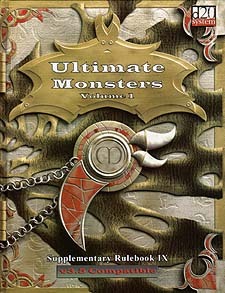 Ultimate Monsters presents a plethora of new creatures, both banal and exotic, benign and hostile. Listed alphabetically for speed and ease of reference, Ultimate Monsters is a tome of knowledge no gaming table should be without - afterall, it might just save your life.